How much would you spend if you needed 100 articles? Decent articles start at $10 for 500 words. That’d amount to $1,000 for 100 decent articles! How about getting 100 great articles for nothing other than a few minutes of your time for each article? Spinner Bros is the ultimate solution to all of your content needs and worries. No more spending money on expensive article writing services or wasting your money on cheap, useless articles. No more spending hours upon hours writing quality pieces of content. Spinner Bros takes care of it all! Spinner Bros also helps you avoid duplicate content penalties. I’m sure you’ve come across articles on other sites that you wished you had on your site. Many folks would copy and paste the article on their site and risk getting a duplicate content penalty from Google. Others would spend hours trying to write a similar article in order to publish it on their site or spend $$$ to get it from an article writing service. However, with Spinner Bros, you can have an article of the exact same quality (or even better) on your site in a matter of minutes without any hard work. Spinner Bros is the best and easiest way to get as much quality content as you need when you need it without expending nearly as much money and time as you’d need to if you were to do it the regular way. And the best part of it all is that you already have it in your possession. All that’s left to do is put it to good use, and I’m going to show you how to do this. So, follow me onto the next page. When you’re ready to start making use of Spinner Bros, the first thing you have to do is have a content strategy. This strategy should include how many times you’re going to be publishing articles per week, your target keywords, etc. If you want to spin articles for link building purposes, you don’t need a content strategy. STEP 1: Grab an article from anywhere. The most popular sources of content for internet marketers are article directories and web 2.0 sites. Article directories are more likely to contain spammy articles, so I recommend that you stick with web 2.0 sites and blogs in your niche. Search in Google for your target keyword and copy any article you like or just copy the URL and use the “Fetch Article From URL” feature to retrieve the article. STEP 2: The next step is to select the readability level. The key to getting high quality, unique, and readable articles from Spinner Bros is to strike a balance between readability and uniqueness. If the slider is too close to “High readability” your spun article will read extremely well, but it will be close to duplicate content. It’s only going to be slightly different from the original article. On the other hand, if it’s too close to “High Uniqueness”, it’s going to be completely unique, but it’s going to read like complete garbage. That said, the setting I recommend depends on the purpose of the article. If you’re planning to use the article for automated link building with tools such as GSA SER, I recommend you set it to high uniqueness since no one is going to read the articles generated. You just need them unique enough for Google to index. But, if you want to publish the spun article on your site or use it for guest posting purposes, keep the slider closer to high readability. STEP 3: Spin the article. To spin the article, click on the “SPIN” button at the bottom. 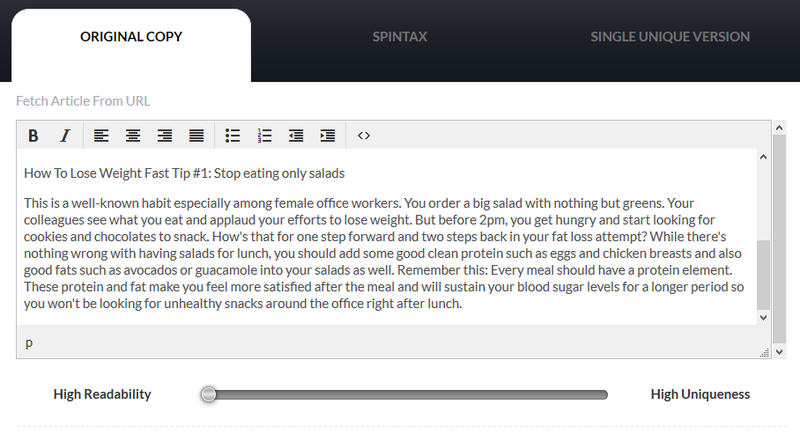 Once you click the button, an article with spintax as illustrated in the image above will be generated. 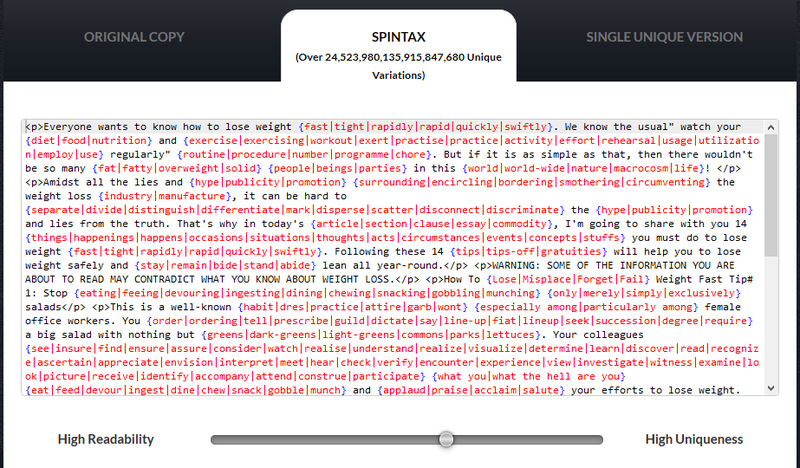 The number directly below the SPINTAX tab represents the number of unique versions that can be generated. In this case, it’s over 2 Billion! If you want to use the article for automated link building, just copy the spintax generated and paste it into your link building tool. Your work’s done! If not, proceed to step 4. Note: If you’re not satisfied with the output, you can use the slider below the text box to increase the uniqueness or readability level and it will automatically update the article. I shifted the slider a bit closer to high uniqueness. The result? STEP 4: This is the point where your efforts pay off. Click the “SINGLE UNIQUE VERSION” tab and you’ll get a unique version of the article, ready to publish on your site. If you need a different version of the same article, click the “NEW VERSION” button and you’ll get it. You can do this as many times as you want. If you want to change the readability/uniqueness settings, simply go back to the SPINTAX tab and adjust the slider. STEP 5: Use the advanced features for even better results and convenience. Protected keywords: Click the settings button (gear icon) at the bottom and you’ll be provided with a text box to enter keywords that you wish to remain constant (never spun along with the other words in the article). You can use this to prevent words like brand names, your target keywords, etc. from being spun by Spinner Bros.
Post to WordPress: Use this to post your unique articles directly to your WordPress blog without ever leaving Spinner Bros. Be sure to add your sites in your account settings to make the process easier. 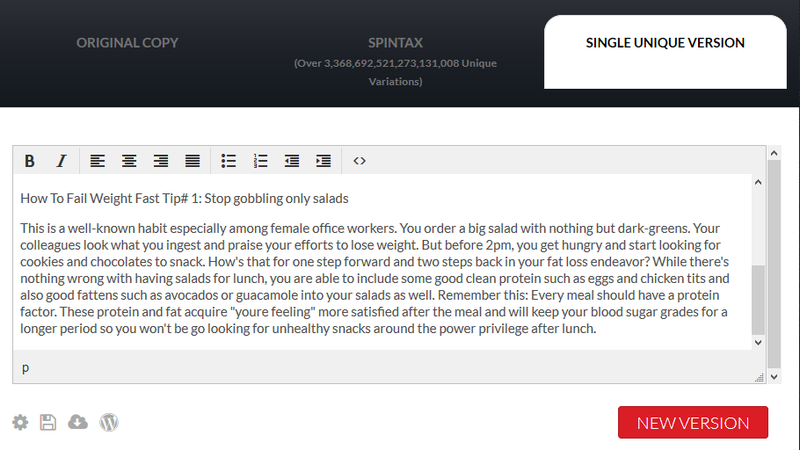 Save to archive: Spinner Bros lets you save your articles so you can edit them later. 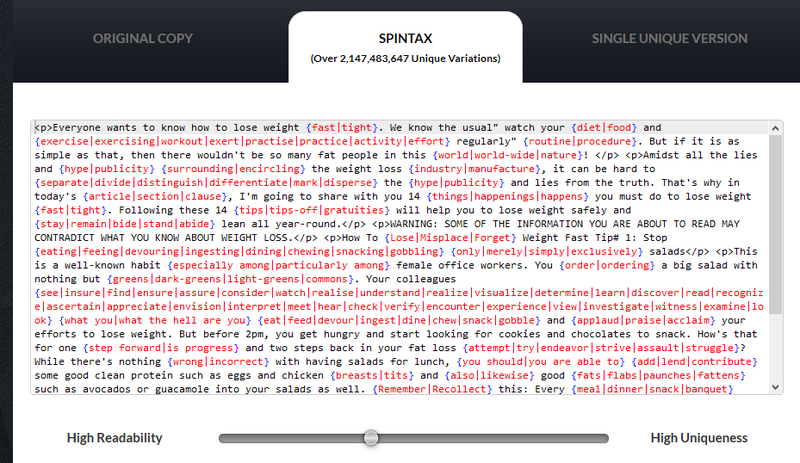 Export: This lets you download your spun articles so you can use them later. STEP 6: Edit your account settings. In your account settings, you can set the default readability/uniqueness level so you won’t have to adjust it each time you want to spin a new article, and more. The settings are pretty self-explanatory, but you can always contact us at [email protected] if you ever get confused! PRO TIP (if you’re publishing on your site): Spinner Bros is a wonderful article spinner and produces great results almost every time, but it’s not perfect (nothing is). So, unless you’re using the generated articles for automated link building, you can’t just blindly copy and paste them onto your site or send them over as guest posts! You have to review them for accuracy and errors, just as you review articles sent in by your writers before posting them to your site. Use a spell-checker to correct common errors. You may have copied some errors along with the original article you spun. Read through the article again and correct any grammatical errors you find during the process. Replace odd words in the article. Expect to find a few of these in every article you spin, although they aren’t always present. These should be enough to bring your article to a state where it’s fit to be published on your site and perform as any high quality article would. We’ve gone over the importance of content in your online marketing efforts, the problem with quality content, how Spinner Bros can help, and best practices for using Spinner Bros.
Internet marketing isn’t easy, but Spinner Bros can reduce the amount of effort and money you have to invest to get results. I hope you found this helpful and informative.